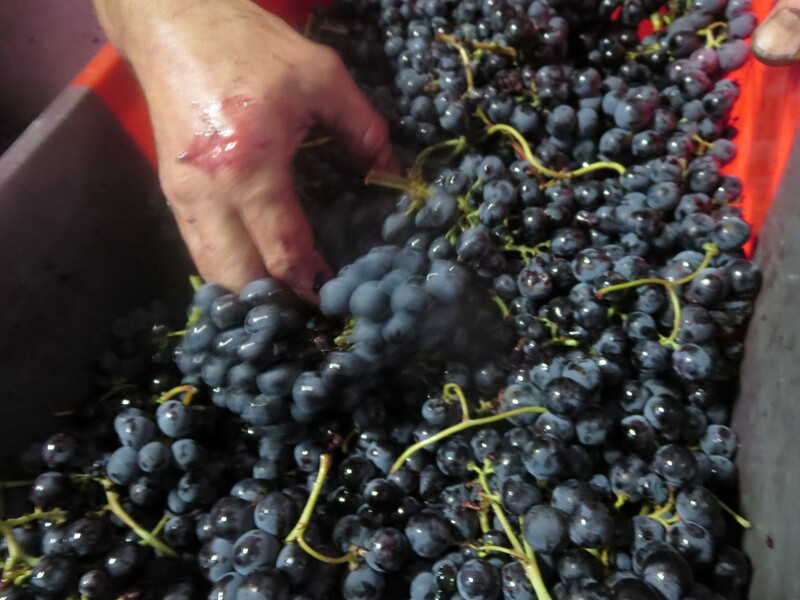 This was the final big week of harvest and it centred around Cabernet Sauvignon. 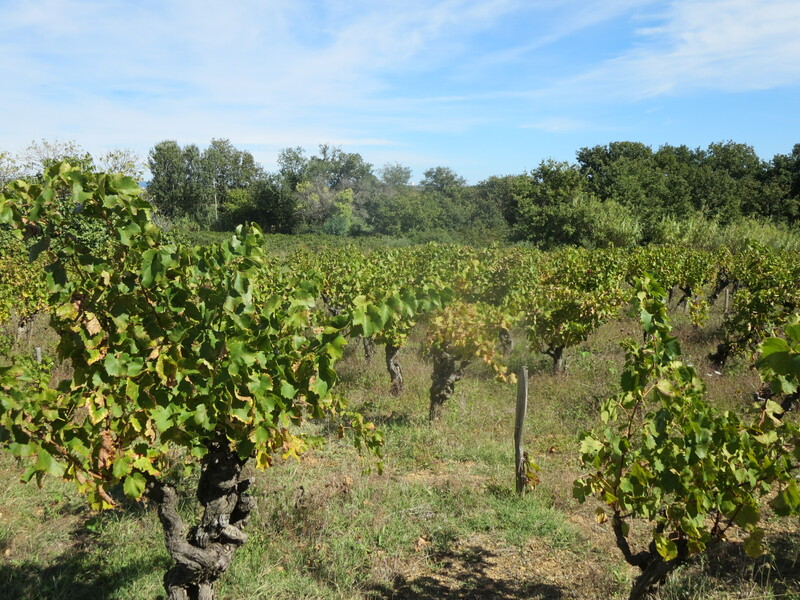 There is a big parcel (around 1.5ha) of the grape in Segrairals and it is not a variety which really excites Jeff for a Mas Coutelou wine. 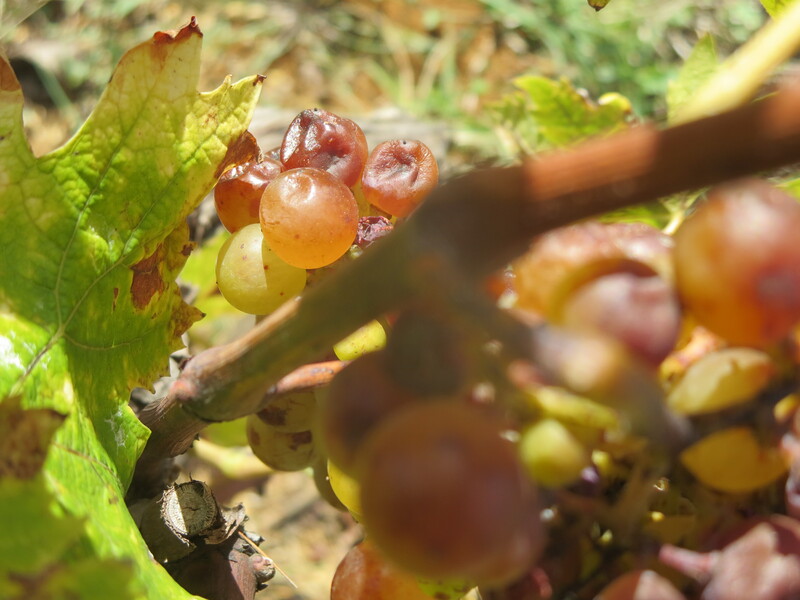 It has done especially well in 2015 though the small berries have swollen with the rains and the alcohol levels had therefore fallen a little to around 14%. 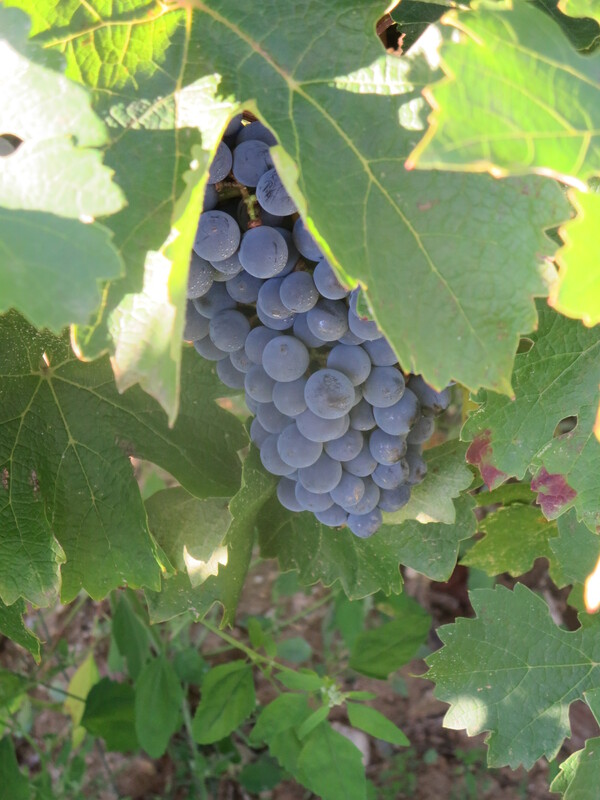 They taste sweet and juicy and came in fantastic bunches, not the same size as the Cinsault and Mourvèdre from this vineyard, but small and healthy nonetheless. 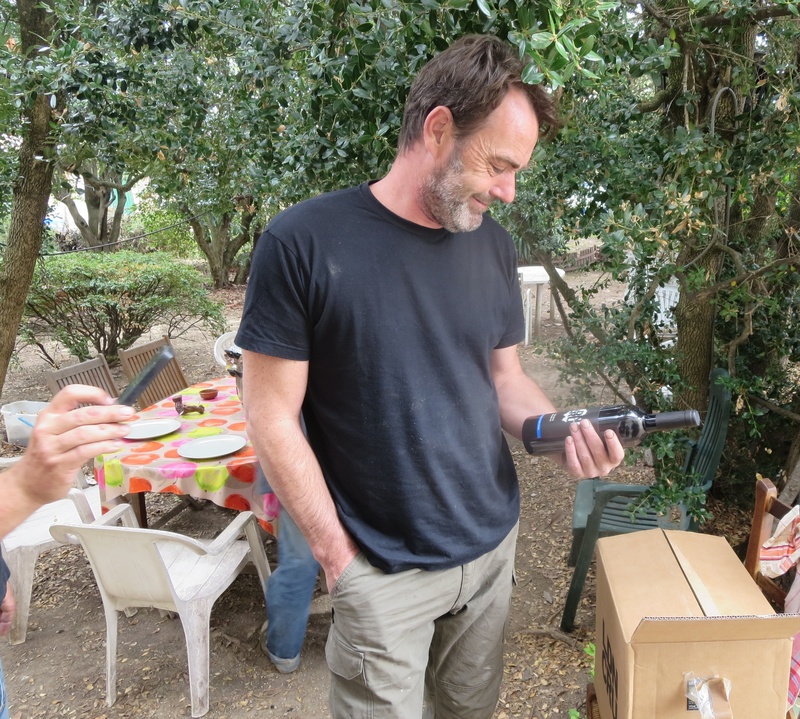 Part of it was picked on Monday 21st September which will be used by Jeff, purpose as yet unknown though Cameron may be flexing his winemaking muscles with some. 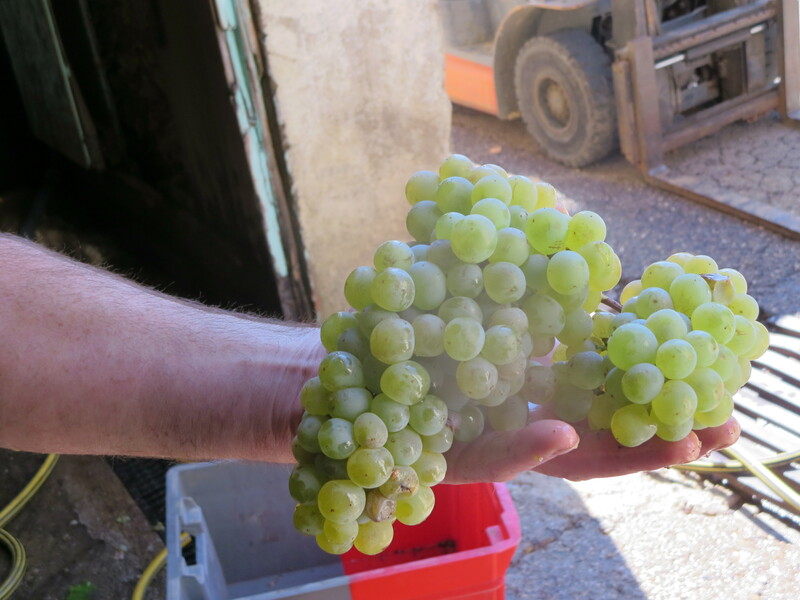 The other major work on Monday was to use the Muscat d’Alexandrie grapes from Peilhan which were also in good health. 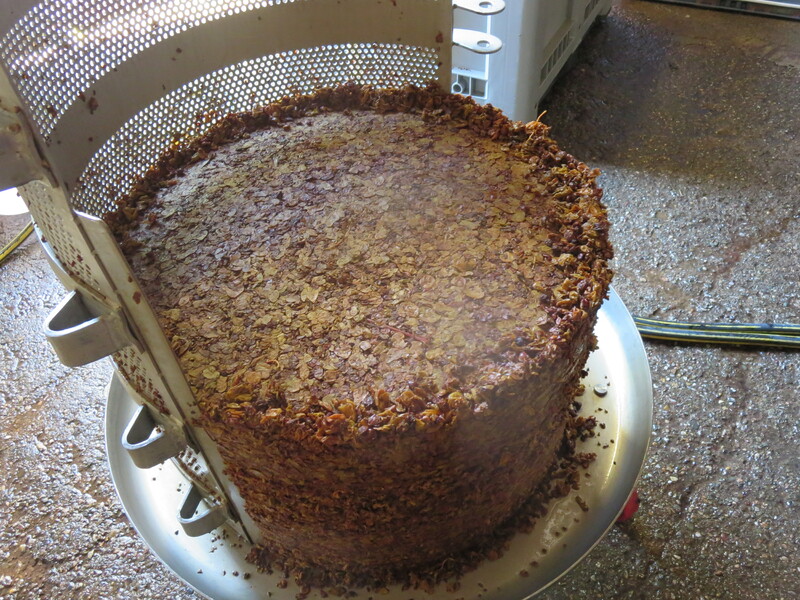 They have very thick skins so the pressing took longer than usual to extract the juice. 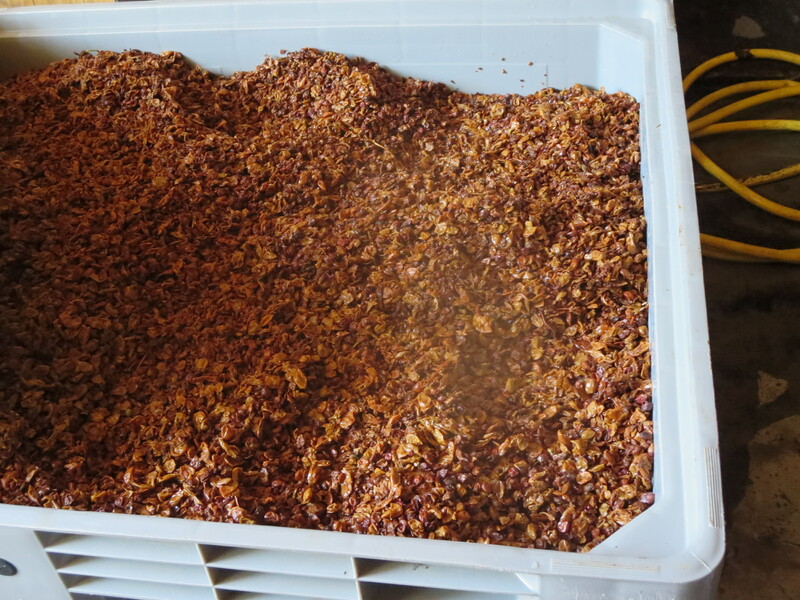 They were mixed with some Muscat À Petits Grains grapes. 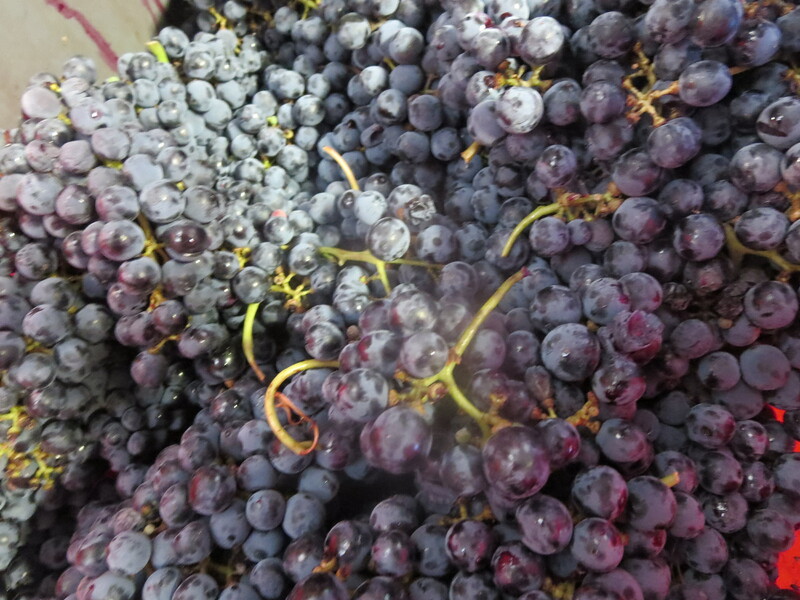 I will come back to these grapes and the juice later in this article. 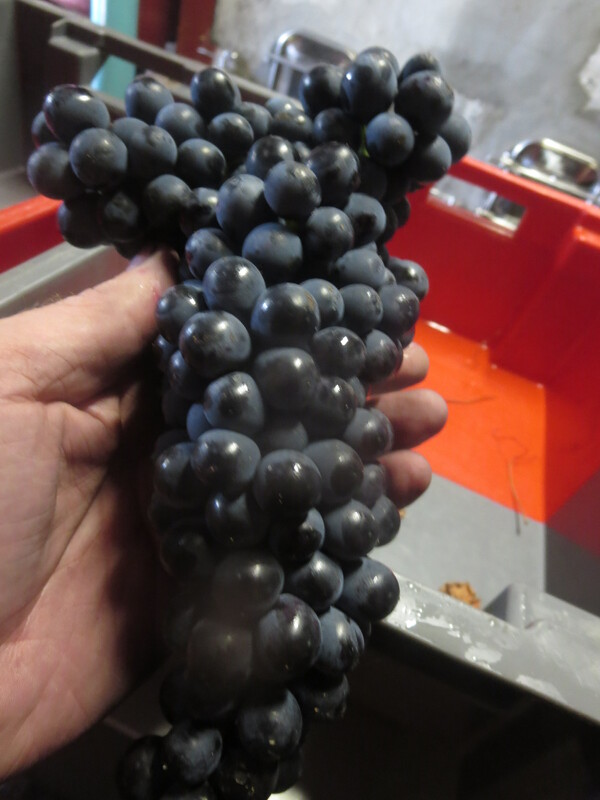 Tuesday 22nd was the big day for the Cabernet Sauvignon. 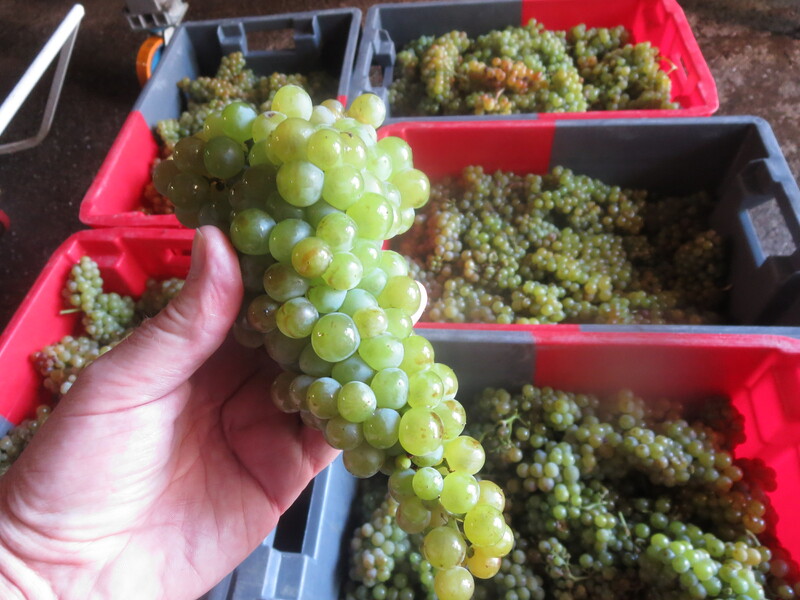 I have explained before that Jeff sells most of these grapes to London Cru, an English winery as the name suggests. 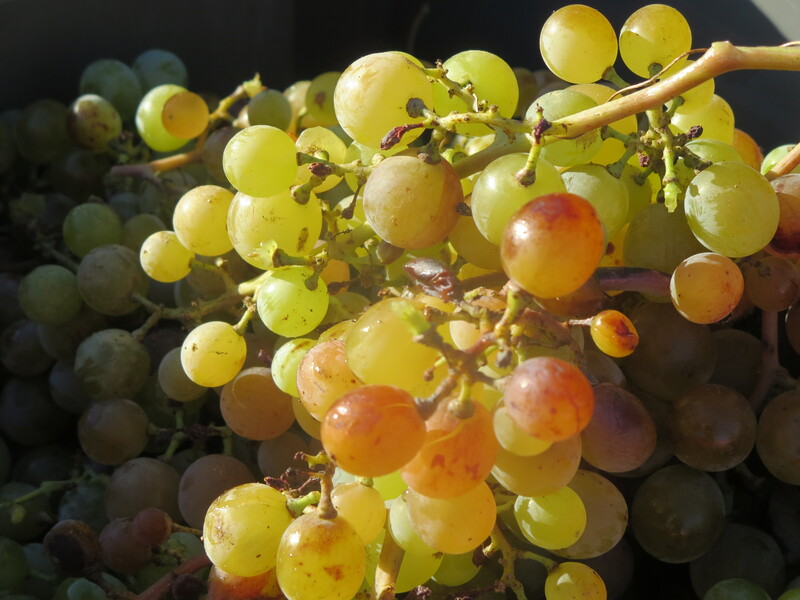 London Cru buy grapes from around Europe, eg Chardonnay from Limoux, Albarino from Rias Baxas, Grenache from Spain. 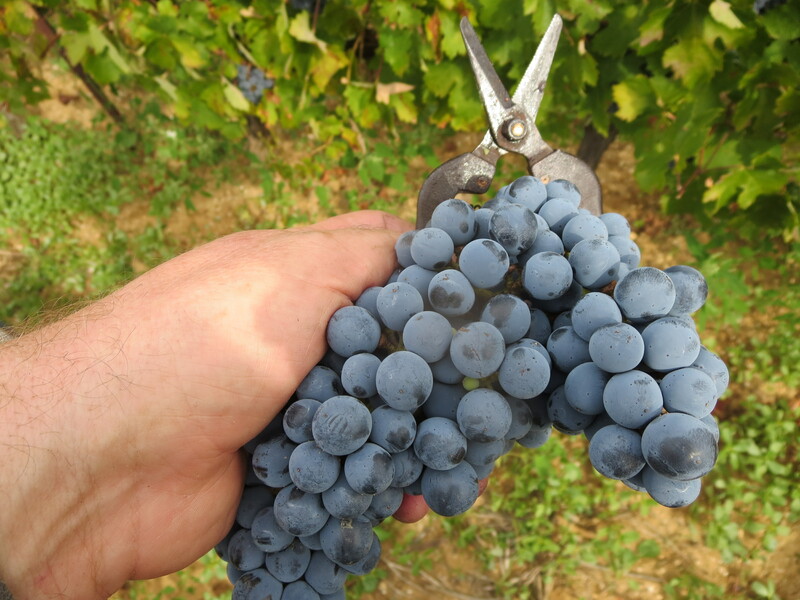 This is the third vintage of the project and the grapes were ready at last. 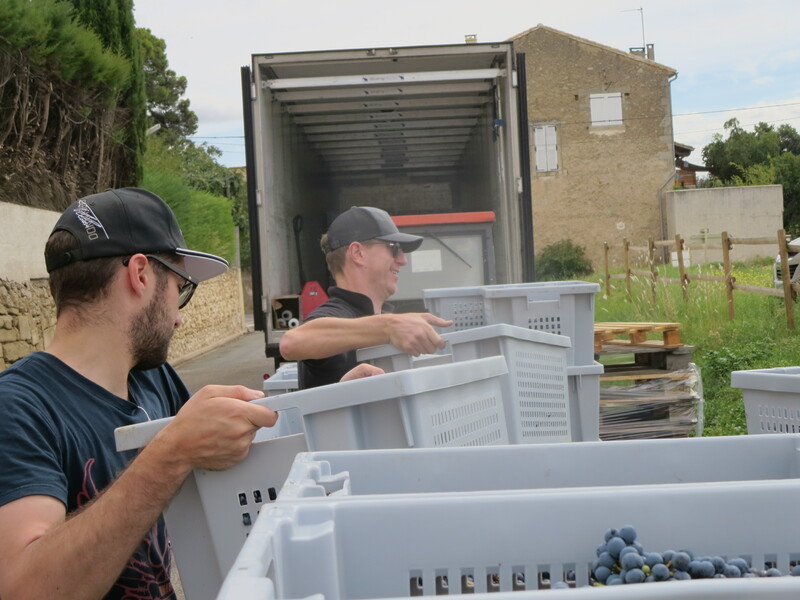 In 2014 they had been ready on September 4th, my first day at Mas Coutelou after our move to the Languedoc. This year the rain had delayed them so Gavin and Alex flew into Béziers on Monday evening. They had been in Italy on Saturday and only just got back to London before flying here. 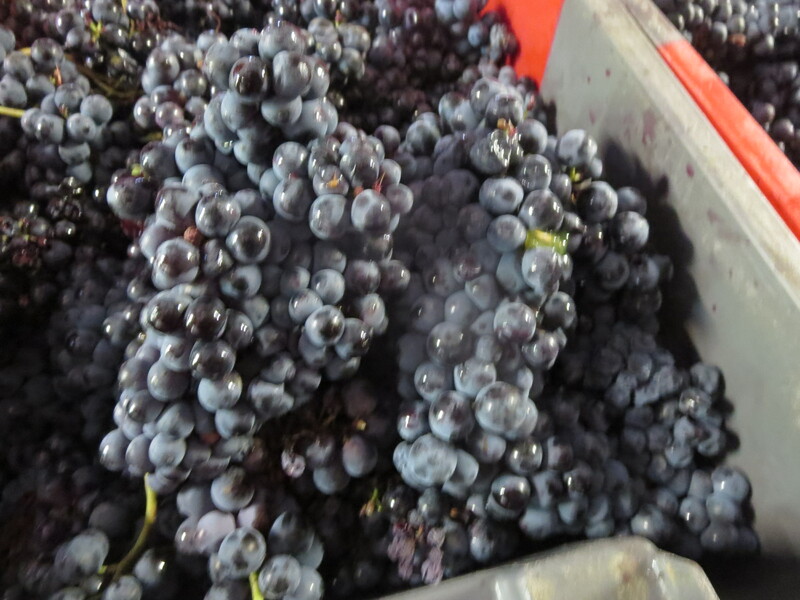 The refrigerated wagon was in situ as I arrived on Tuesday morning, waiting to be loaded with the grapes. Confidence was high amongst the London Cru team after some very good reviews including one last week by Dr. Jamie Goode who gave the top mark (94/100) to the Cabernet Sauvignon using Jeff’s grapes. 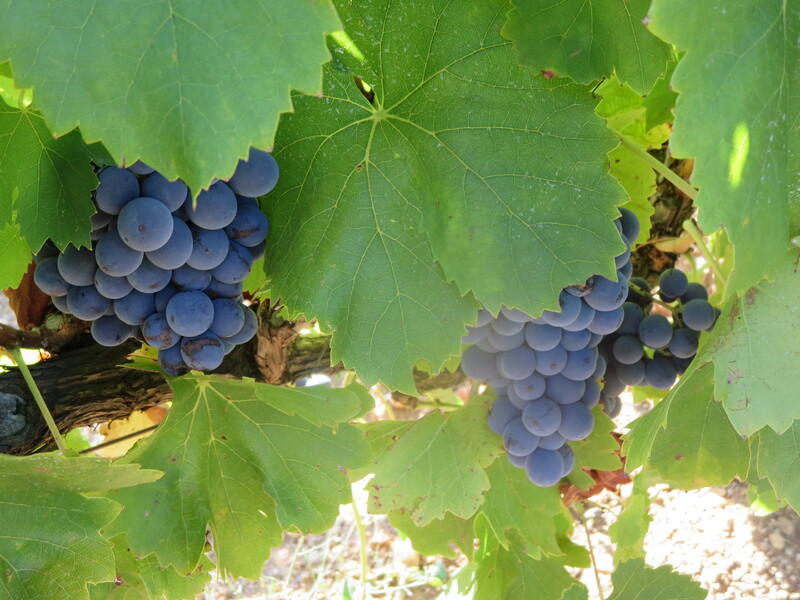 The fruit for 2015 should bring more high marks and good wine. We tasted the 2014 over lunch and it was very good, clear, direct fruit with ripe tannins which mean that the wine will be at its best in 2 to 3 years. Gavin, Alex and Jeff directed and led the picking carried out by the Moroccan team as usual but also by Cameron and myself together with two excellent new additions to the team in Fabrice and Romain. Fabrice puts on shows (spectacles) around France whilst Romain is an artist. They have picked here before and were good fun and hard working, more new friends. (Fabrice on the left, Romain to the right. 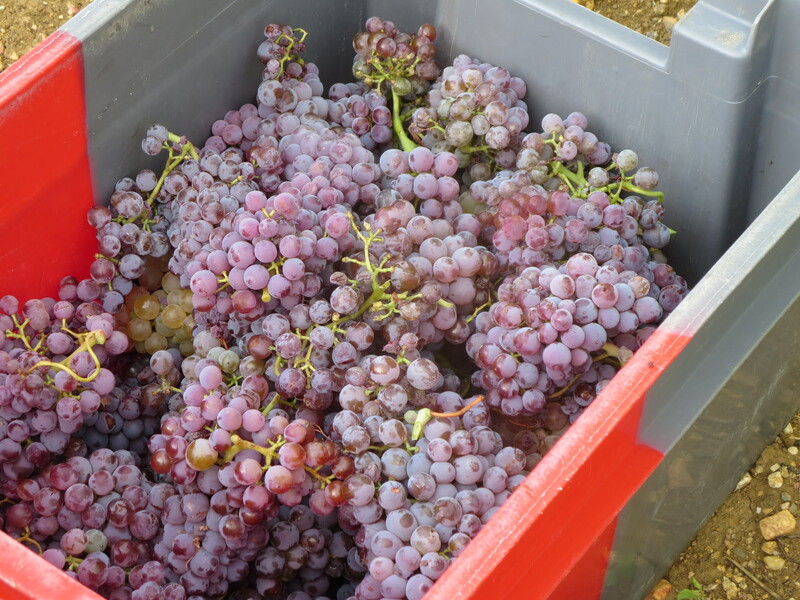 After picking the 6 tonnes or so of grapes they were driven straight off to London under refrigerated conditions to keep them fresh. Gavin and Alex flew back to London that evening ready to receive them at their base. 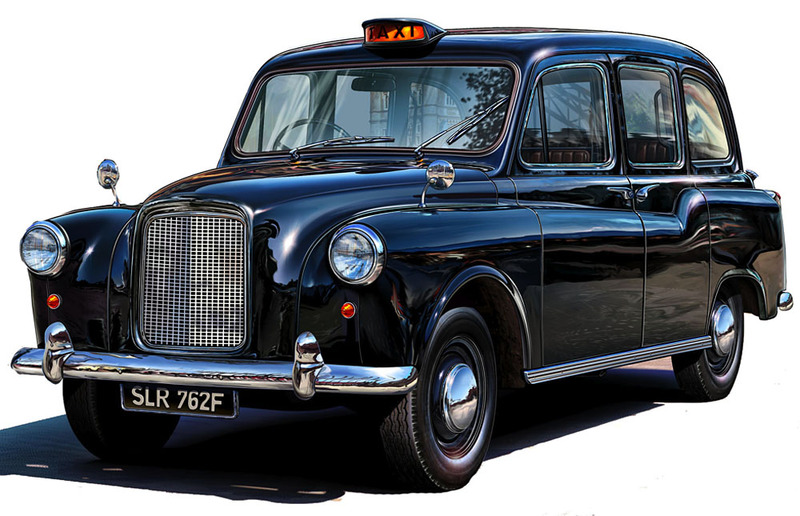 London Cab, fine fare. Lunch was excellent with the London Cru wine and a magnum of Flambadou 2014 which was excellent, still in its infancy but already drinking well. 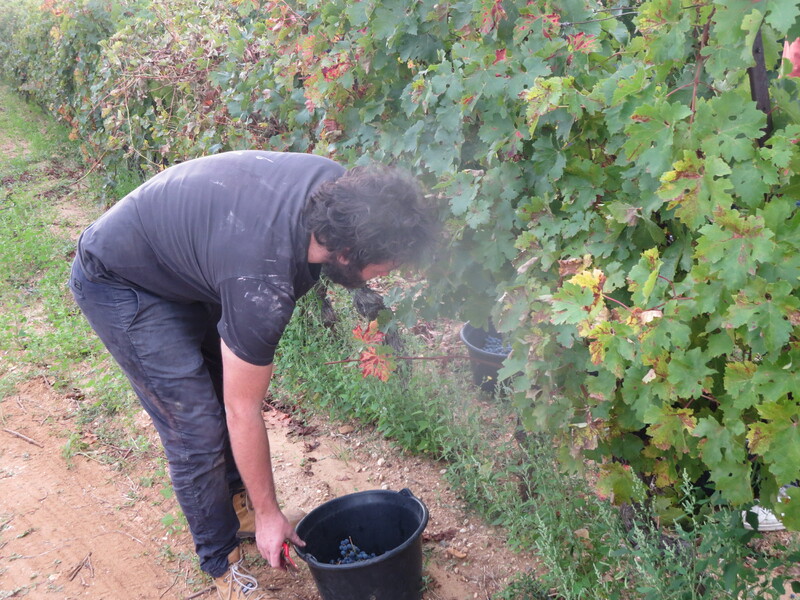 Afterwards Cameron and I did some pigeage of the Carignan grapes amongst others. It was also Cameron’s birthday, hopefully it was one he will remember with affection. Wednesday 23rd was a day for working the cellar. 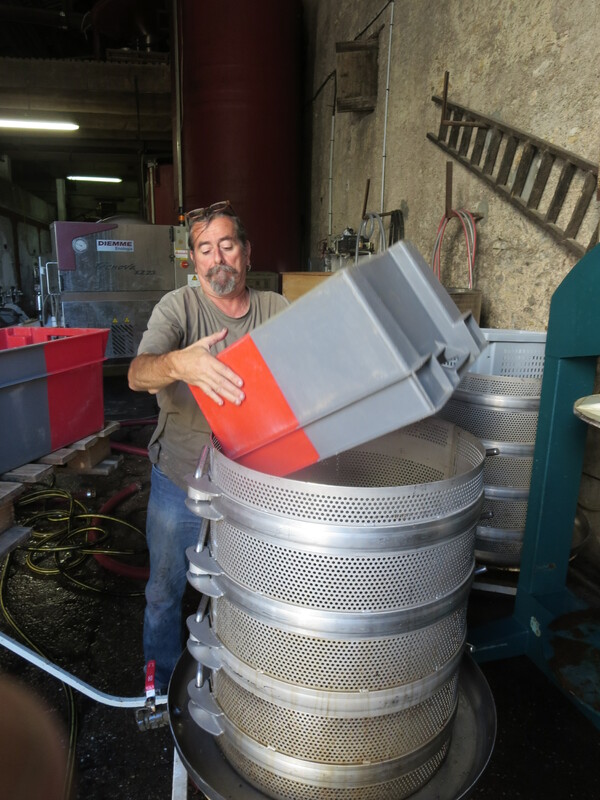 Jeff was keen to aerate the Syrah a little and to start to maximise the cuves by assembling some of the tanks and filling the new ones. Thursday saw similar work whilst Jeff also did some admin work. 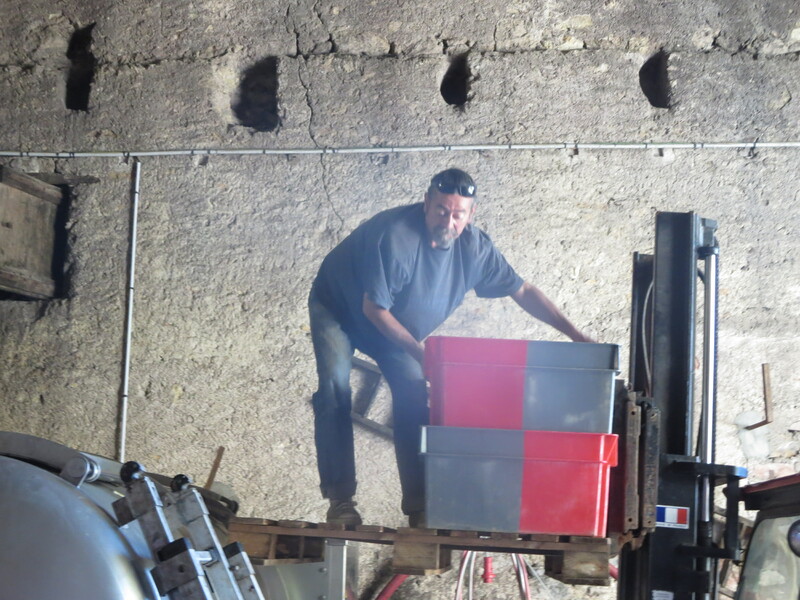 On Friday 25th I returned to the cellar. Cameron was enjoying a well earned break and so I joined Jeff and Michel. 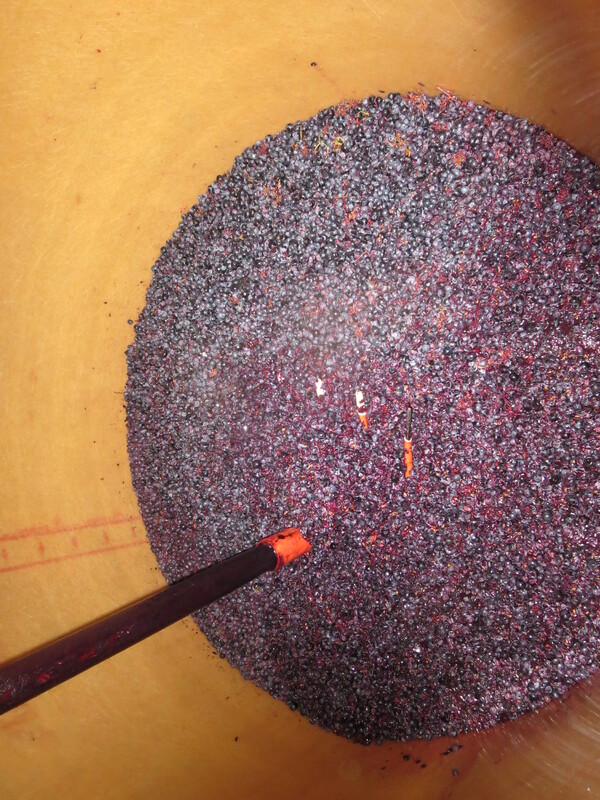 They were continuing to fill the tanks, aerate some wine and then we moved to the muscats from Monday. 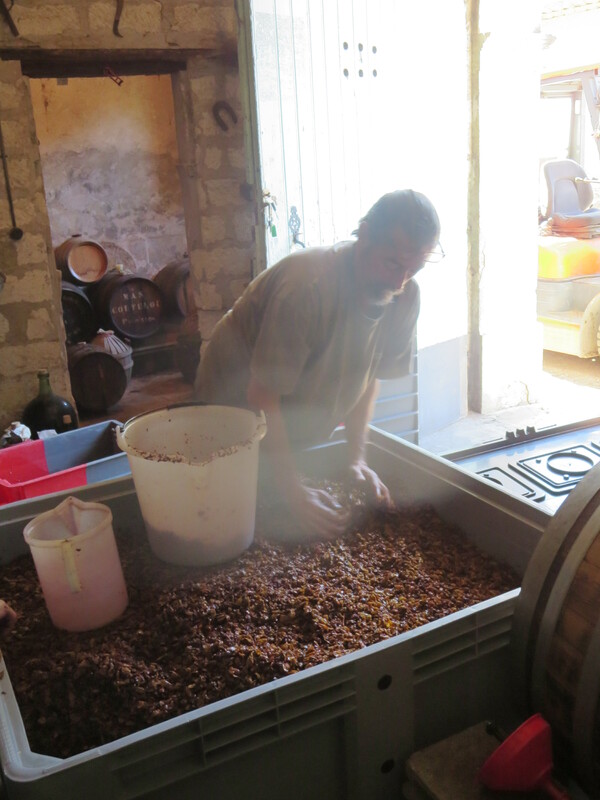 The Muscats are destined for the solera system and after a few days maceration they were showing lovely aromas, already slightly sherry-like due to being mixed with some older wine. 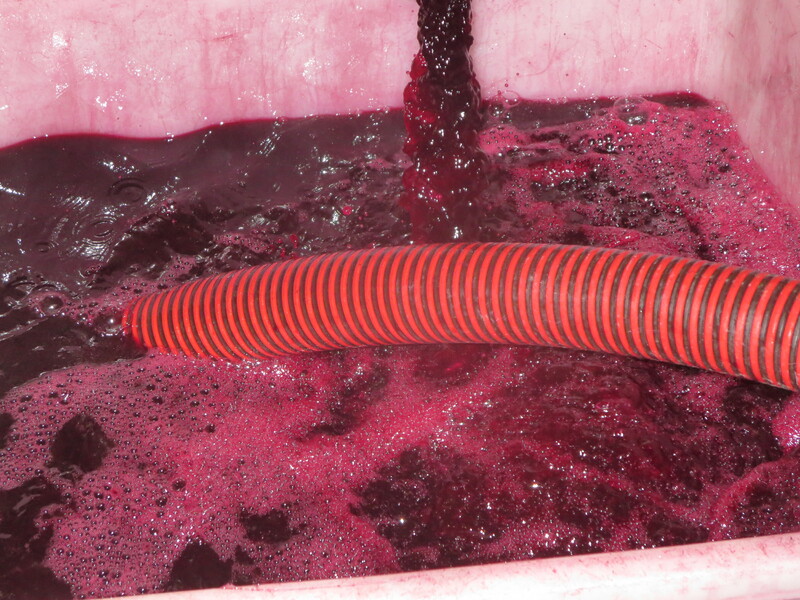 The juice went straight into barrel whilst the marc was pressed again to extract more juice and flavour. Tasted straight from the press these included lovely apricot, plum fruits along with the slight oxidised note which adds complexity. 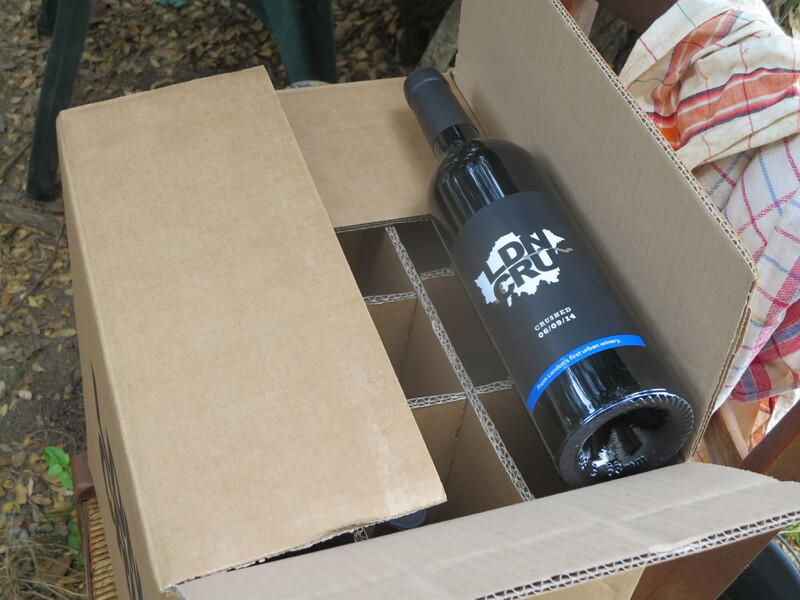 Truly delicious, I’m afraid my description fails to do it justice.The barrel will allow the wine to age and gain contact with oxygen and the wine will develop into a luscious sweet wine. 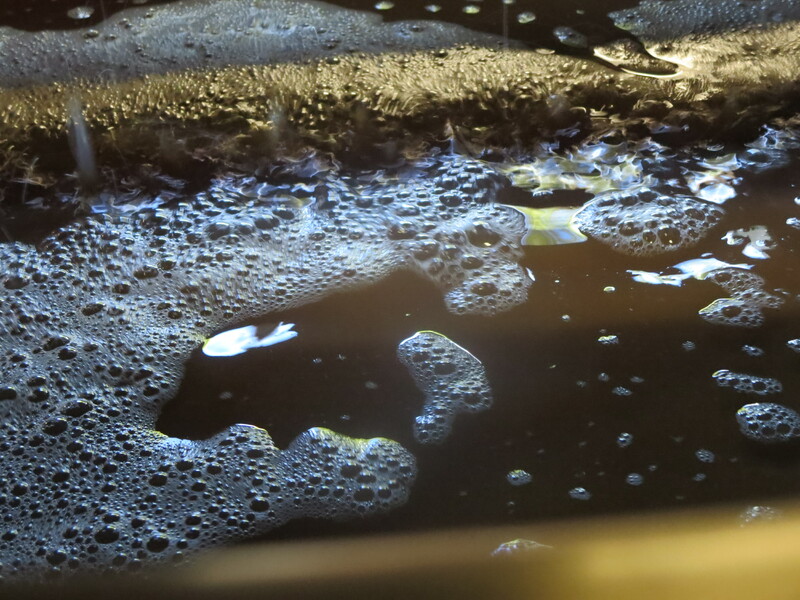 As stated previously I shall write more about the solera in the near future. 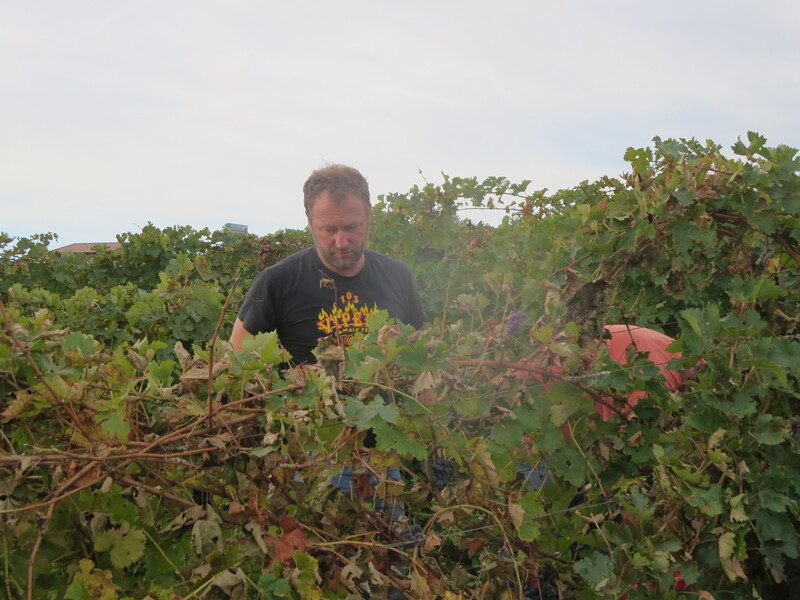 There are one or two small parcels still to pick but the main harvest is now over. It began back on August 21st so lasted just over a month. I shall be reflecting upon it and the lessons I have learned from it in the next article. 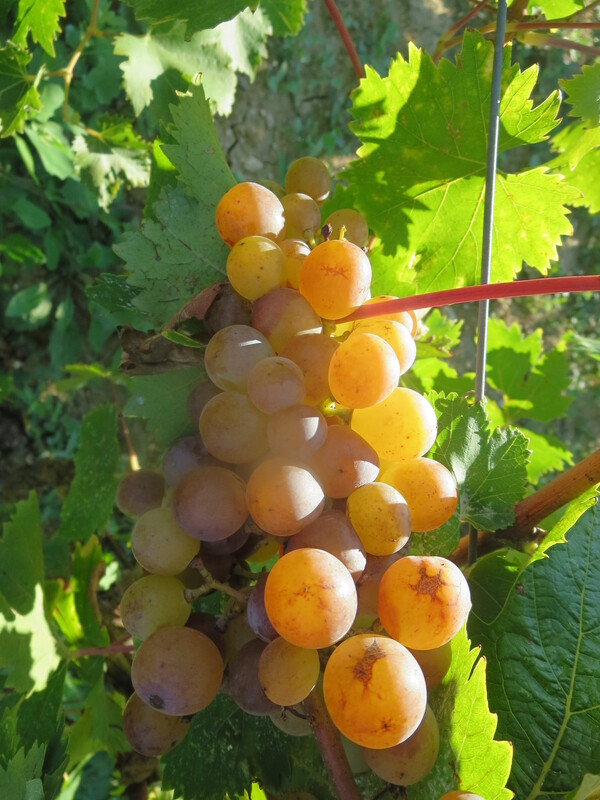 Meanwhile I look forward to picking the Muscat from Rome and went to the vineyard on Friday lunchtime to take some photos. I was met by a family of partridges, butterflies and birdsong – Rome really is a magical place. 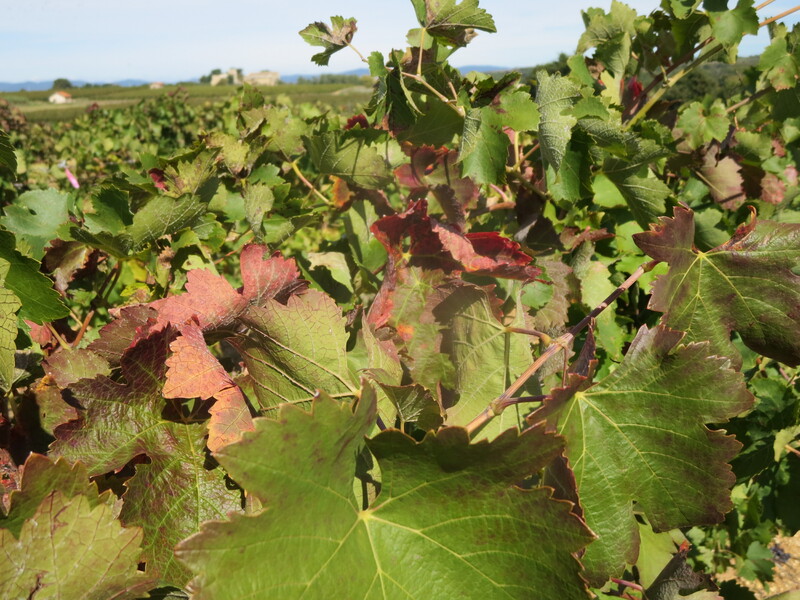 In La Garrigue the vines are starting to show their autumnal colours, their work is done for 2015. 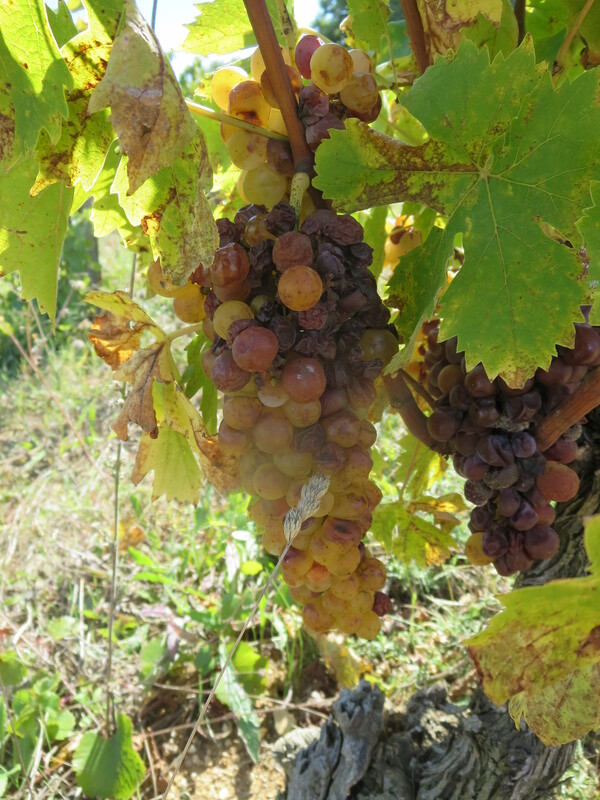 The vines have given everything to their fruit in the last month and the leaves which remain after harvest are looking tired after a long, hot summer. All, or nearly all, is safely gathered in. La Garrigue, Friday. 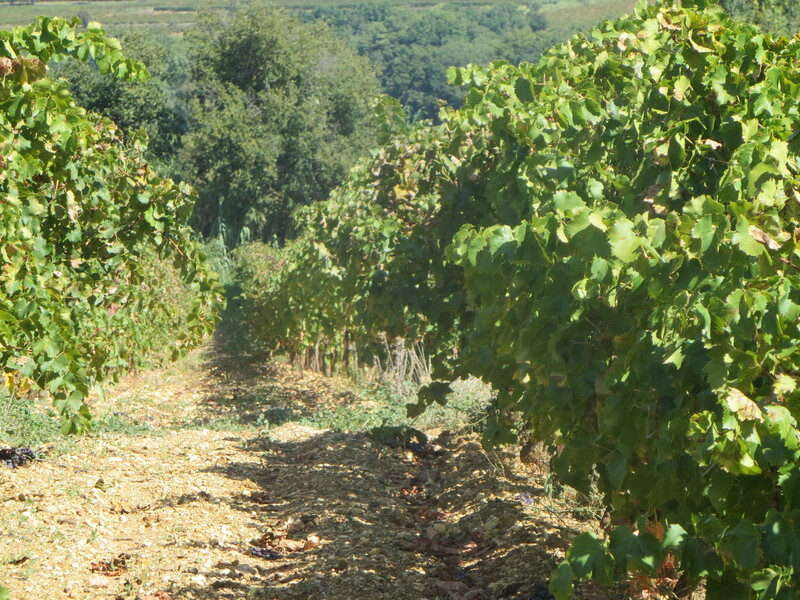 The grass across the centre marks the ridge with Grenache near side and Syrah far side. Categories: Vignerons, Vines, Wines | Tags: Cabernet Sauvignon, Carignan, Flambadou, La Garrigue, London Cru, Mas Coutelou, Muscat, Muscat d'Alexandrie, pigeage, Rome, Segrairals, solera | Permalink. The London Cru project is really impressive. Always good to see the quality of the grapes they are buying. You lead a magical life, Alan! ps looked up in the queue in Aldi on Saturday and saw you leaving – was that a €1.99 bottle of Corbieres in your trolley? There’s a very good €2.80 organic Corbières at Nourri Bio. Screw cap too. Often buy it.